This probably turned out to be one of the best weekend meets of the year yet only four members (Ken, Ewan, Chris M and Yvonne) attended. 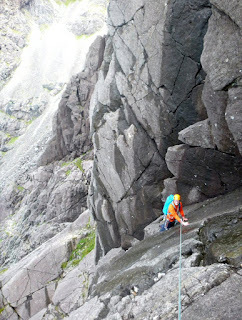 It was raining during the Friday night but by morning the nearby south facing crags were already drying. 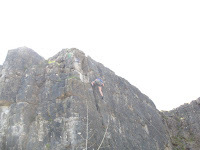 Chris and Yvonne fancied climbing on Craig y Clippau but somehow lost their way in the slate heaps and landed up at Craig y Wrysgan where they climbed the famed Honeysuckle Corner amongst other routes. 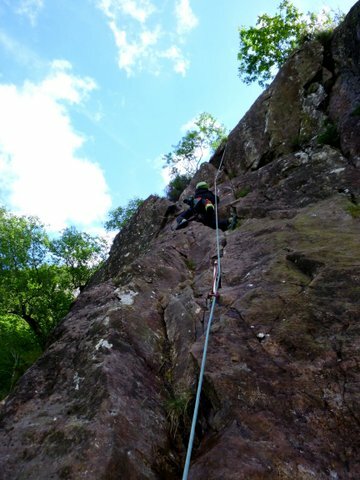 Meanwhile Ken and Ewan donned on their big boots to climb the seven pitch v. diff. route of Slick. 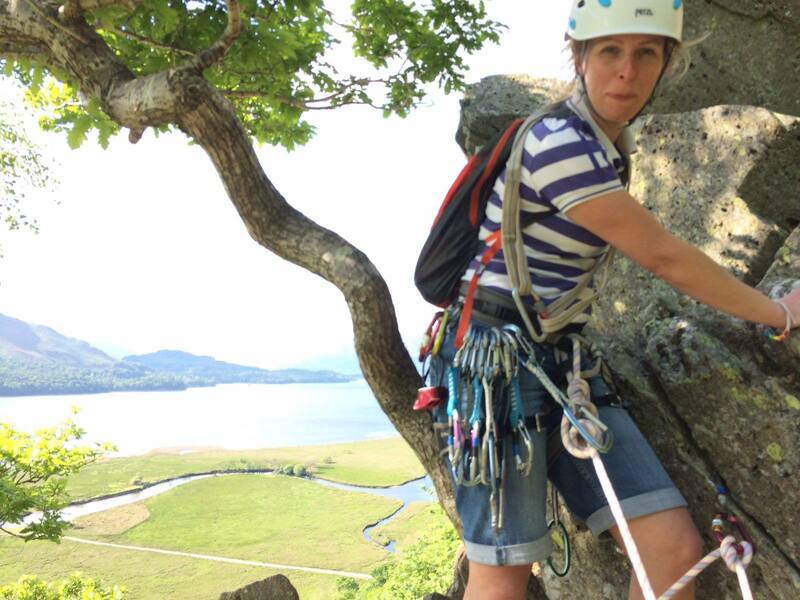 This was a lovely varied route offering some quite tricky old-fashioned climbing from time to time. After lunch they changed climbing technique, putting on the rock shoes to climb "Orange Outang" an 80 metre hard severe with rather sparse protection. 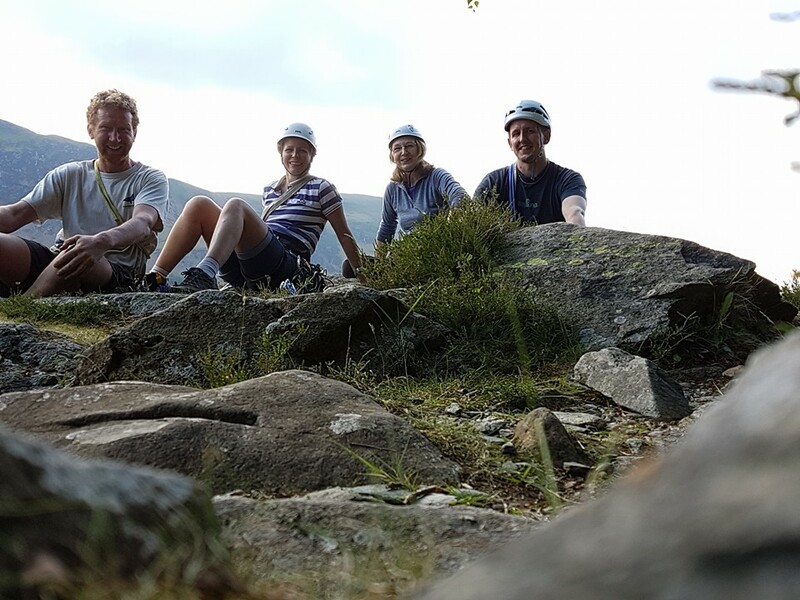 There are many eating out possibilities in Blaenau Ffestiniog (pubs, cafes and Chinese take-away) two miles from the hut at Tanygrisau but we decided to cook a meal and eat in the hut going out to the local friendly pub (the Kings Head) fifteen minutes walk away later. We soon got bored with games of dominos so the landlord produced a game of draughts which was more exciting. All of us had forgotten how to play this game but after a false start placing the pieces on all the squares as though we were playing chess, the locals came over and put us right. It rained during the night and the hills were still covered in cloud in the morning. Ken suggested a low level walk from the hut into the Vale of Ffestiniog. The walk followed close to the Ffestiniog railway track but then departed as the railway entered a tunnel Our trek over the hill brought us to old rail embankments and a tunnel which was abandoned when the Tanygrissau reservoir was built and the pump storage scheme with the nuclear power station of Trawsfynnod. We heard a train whistle in the distance so headed for the loop-the-loop new railway track at Dduallt built to gain height to avoid the reservoir. Well worth the wait eating early snacks in the sunshine, we were rewarded with a first hand view of the train and its six coaches thundering round the bend before the loops and a second view as it crossed the bridge looping over itself. 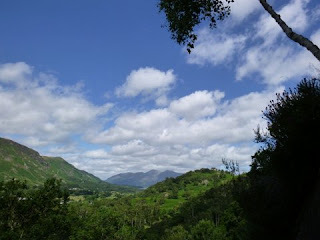 Our walk then took us westward to a path junction which returned us to Dduallt station. 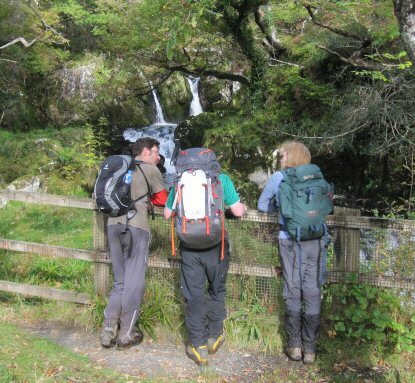 The continuation of the walk took us into the forest region of Clogwyn y Geilfr and the ravine of the Afon Goedo. The walk followed the river in part past waterfalls and then crossed into open moorland for the return to Tanygrisau. I'd heard before tales that the Vale of Ffestiniog was lovely and they were correct. 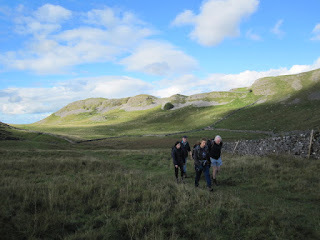 This lovely walk takes in the best scenery around the Settle area. Roger, Les, Carol, Ken F, and Heather started on the most beautiful day of October sunshine. The first main attraction of the walk was a tour above a very large limestone quarry leading to Schoolboys Tower. 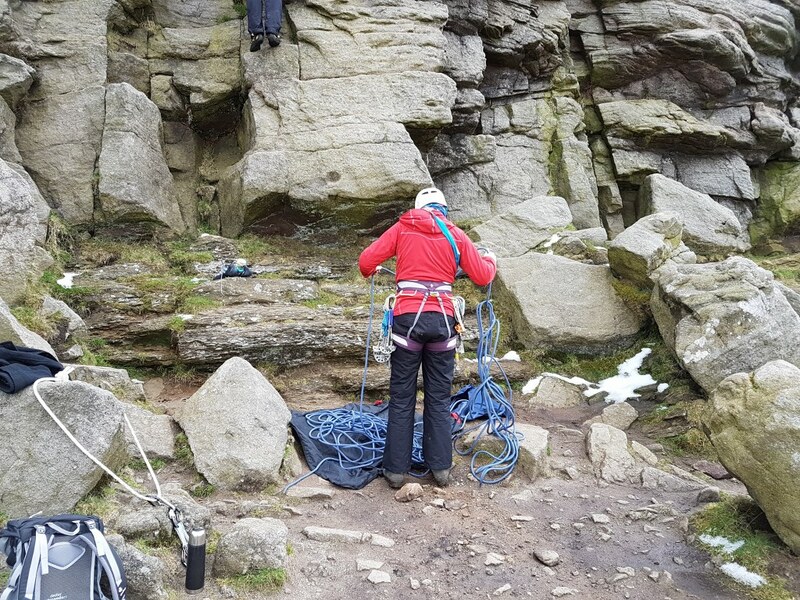 The quarry seems to be disused and will be a useful climbing area in the future when agreements are made to climb on its fine, long, limestone lines. Undulating ground westward and northwards took us to the tiny village of Feizor. A tiny cafe was open but we had more important trekking to go eastwards to the Craven Arms pub at the village of Stainsforth. 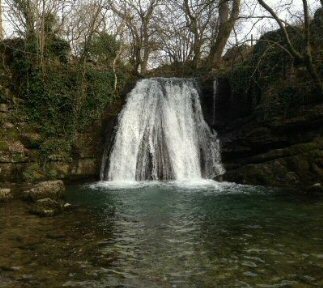 After the meal, we ascended the track near Stainsforth Beck to see Catrigg Force waterfall. It was here that the planned continuation walk plans began to unravel. 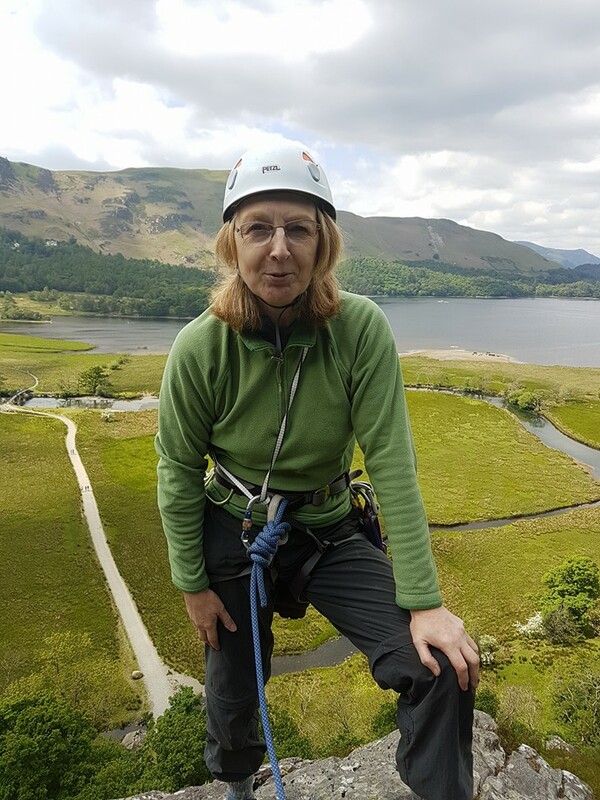 The planned route would visit the caves and limestone cliffs of Attermire Scar but Les was suffering from a hip problem and the easier option was to follow the River Ribble, where salmon were said to be leaping up the waterfalls, to Settle. There were many groups of people by the waterfalls but they were probably disappointed. 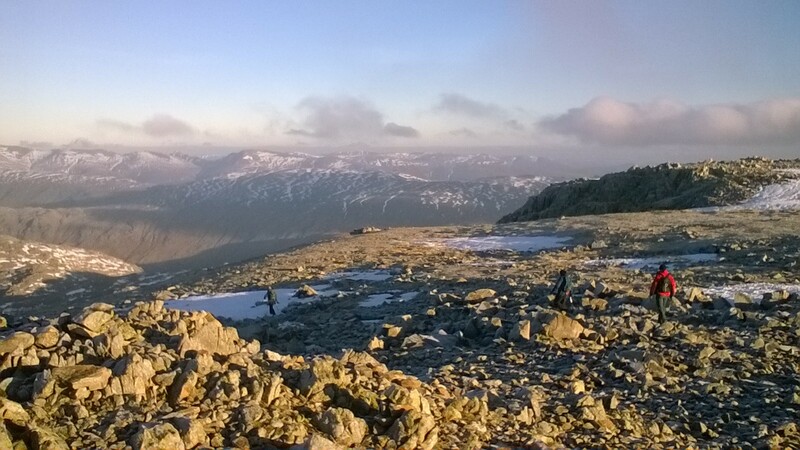 The meet took place using the recently improved BMC Glen Brittle Hut. 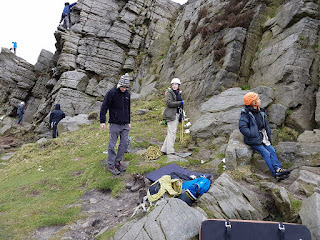 The weather was variable but with a couple of good days. 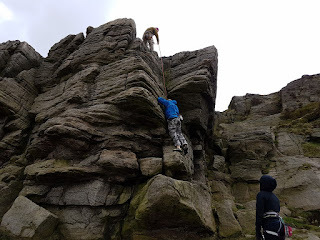 As a mixed group activities included walking, scrambling and climbing (when it was dry enough). 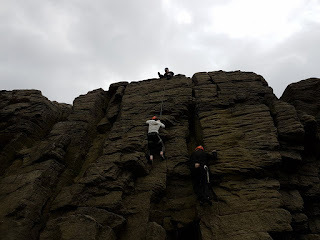 Places visited included Coire Laggan, (where some brave folk endured the freezing waters of the lochan, Uillish, Suisnish, the Coral Beach, as well as Chris and Jonah's exploits in Sron na Ciche. Visits to the Old Inn at Carbost produced an invite for Chris to join in the Friday night jam session with the very accomplished local musicians. Chris more than held his own, delighted to find he was playing with a former Peat Bog Fairy(google if you need to). Mention must be made of the gourmet food - thanks to all the contributors, especially Malcolm. 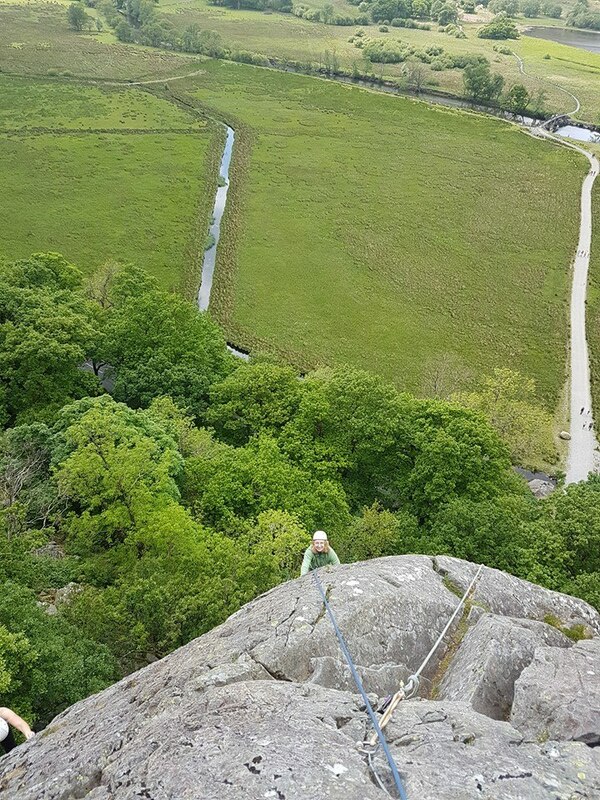 Photos include a venture onto a decidedly damp Sron na Ciche for some lower great classic mountaineering routes on the famous Cioch Buttress. A pleasant ambling approach via The Terrace and Collie's Route (mod) culminated in the excellent Wallworks Route (V. Diff) with an improvised variation to avoid a damp and protectionless corner. Later in the week with cloud still blotting out any suggestion of sun Chris managed a section of the ridge, approaching via the spur on Sgurr an Fheadain, before scrambling the section from Bidein Druim nan Ramh to the summit of Bruach na Frithe, rewarded with superb views across to Bla Bheinn. On the final day, the rain held off long enough for Chris to make a scrambling ascent of Central Buttress (diff) in Coire a Grundda, an excellent long climb in a spectacular and lonely setting". 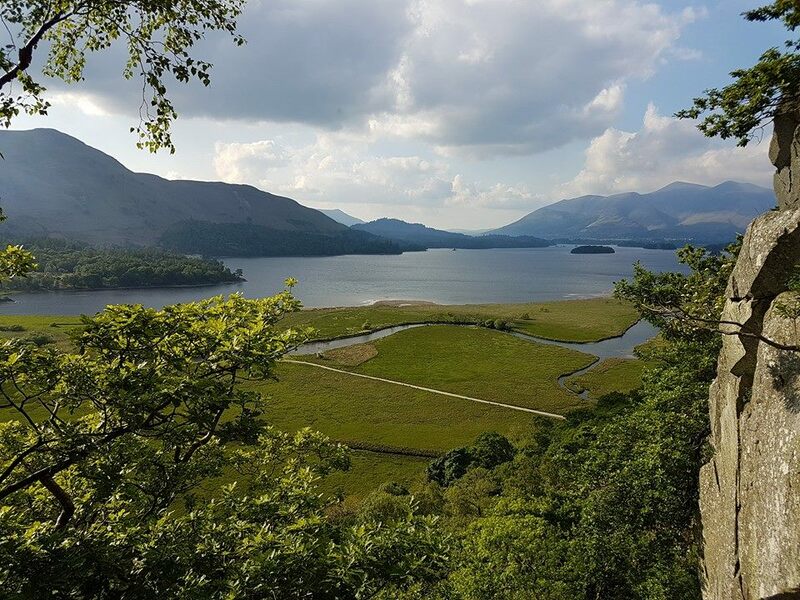 We were spoiled with lots of sunshine this weekend in the Lakes for the club BBQ meet. 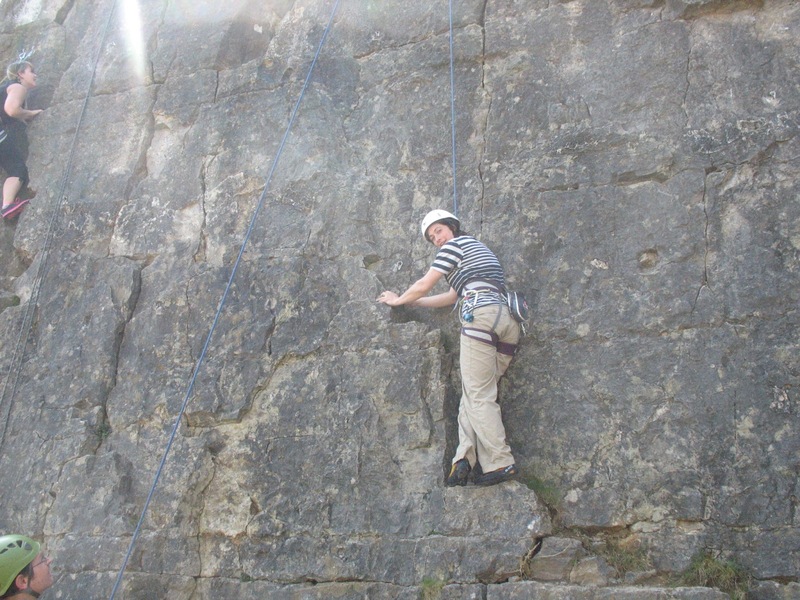 Both climbing and walking were able to be enjoyed by members and guests. 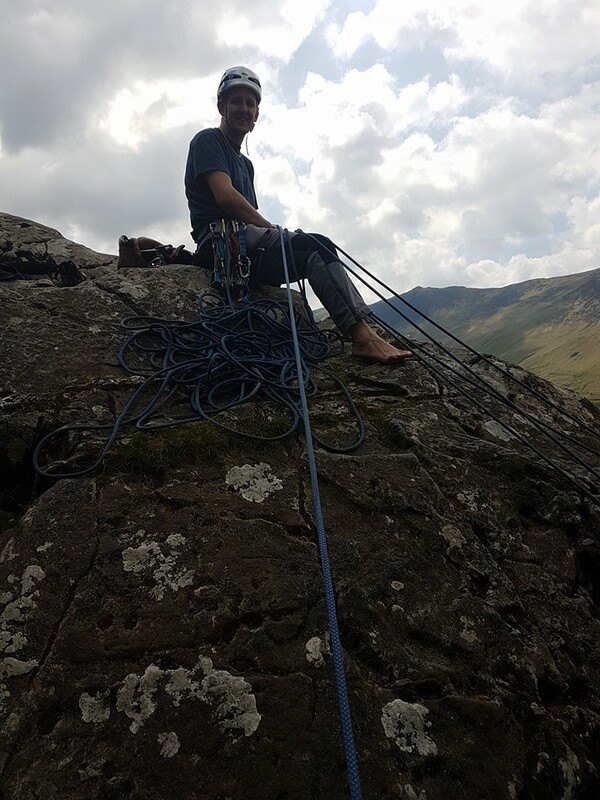 On the Saturday, Ken undertook a full day's walking on the ridges surrounding the hut while Chris and Hannah took Alfie (aged 8) on his first multi-pitch route - Quayfoot Buttress in Borrowdale. 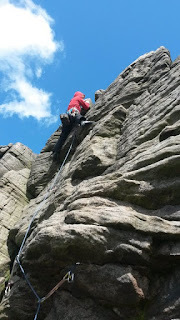 A fantastic climb although slightly damp still in places from the recent rain, but with beautiful views throughout! Sarah, Brian and Yvonne joined us Saturday evening for the BBQ - thanks to Sarah for the homemade goodies! 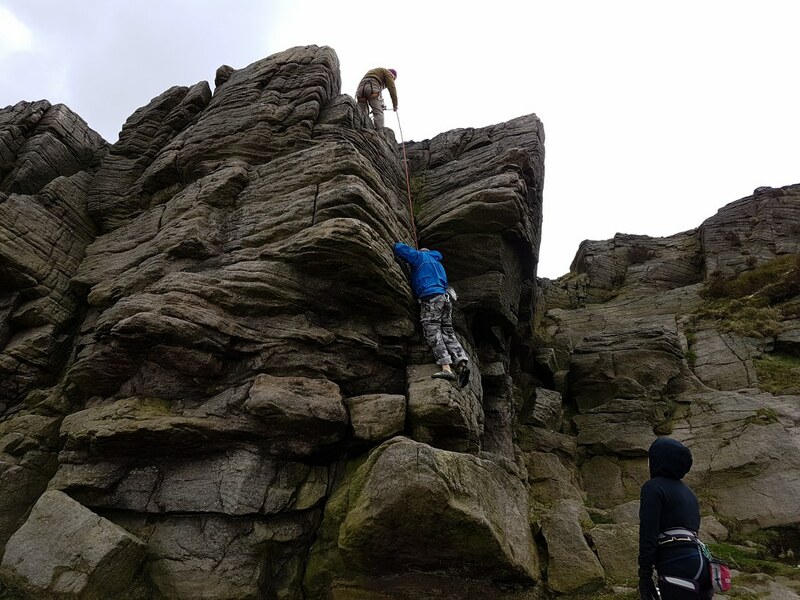 Alfie (8) on Pitch 3 of Quayfoot Buttress. 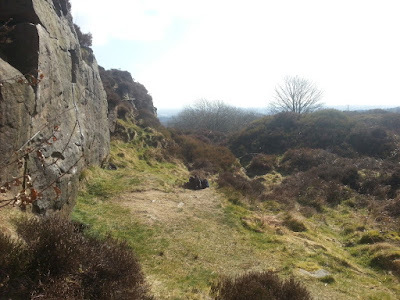 The Sunday walks try to find interesting hill territory within an hour's drive from St. Helens. This classic walk is so well known that an exception was made with a longer drive. Seven members arrived at the start point near Malham Tarn on a misty, quiet day. The calm did not last long - as soon as we met the Pennine Way path to Malham there were hoards of fellow trekkers. 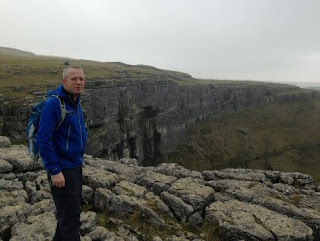 A tea break on the limestone pavement above the cliffs of Malham Cove was tranquil but the steps down to the cove were thronged with tourists. 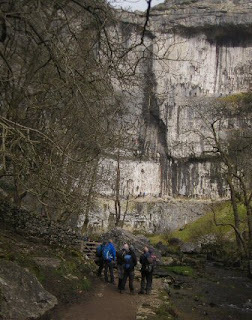 Fortunately our route to Malham now veered from the tourist track leading us directly to our lunch destination, the Buck Inn. If you want a cheap meal this is not for you but the quality of the beers and the food was excellent. 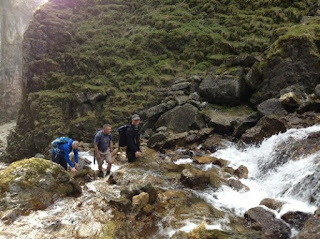 Continuation of the walk took paths by Gordale Beck and the magical Janet's Foss. 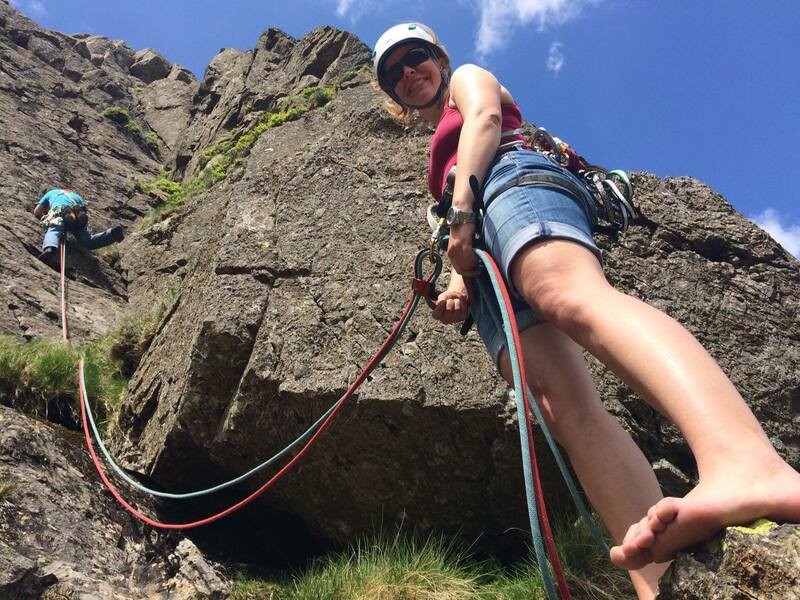 Gordale Scar offered a welcome challenge to the climbers amongst us. (see above pictures). A good day out and well worth the long drive. This meet was quite well attended, by club members (7) and visitors (3), despite strong winds and the constant threat of showers. 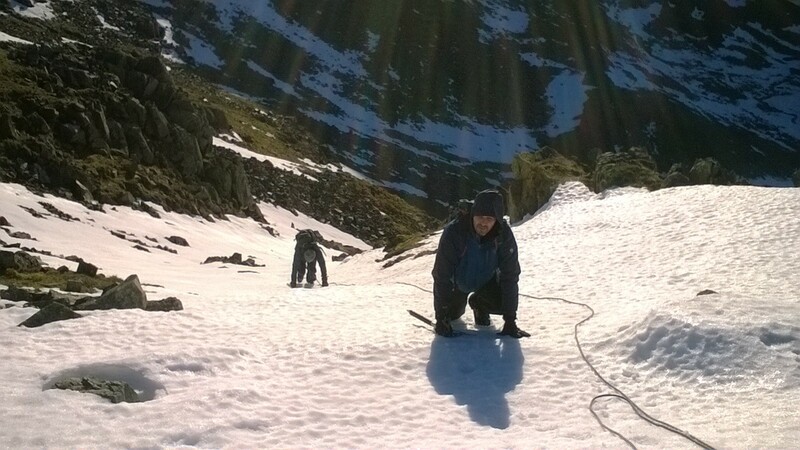 The location was an attractive setting ahead of the climbing, with a layer of snow & ice (yes in April! ), but the Sun was strong and providing some much needed warmth. With a good mix of beginners, improvers, and experienced members, a lot of fun was had. 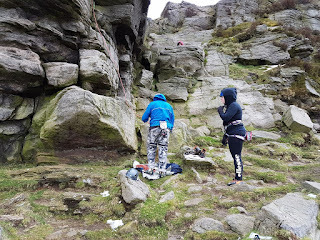 There was something of a family theme earlier on, with Simon and his son having fun finding gear at the top of the climbs (which at Windgather involves a keen eye and a spot of creativity). John brought his teenage daughter along, presumably hoping to inspire her with a love of climbing, but failing comprehensively, as the wind blew them both off the crag and into the pub after an hour or so. Paul Haunch and Barry Standish were out to for a good start on the rock with the club and after the winter period, Windgather is a good setting to get back into the swing of things. A few hardy souls stayed on though, with Hannah and Yvonne both impressively building on their experience of leading and belay-building. One day we’ll go to Windgather when it isn’t howling a gale. Or maybe not…! Hannah Carrington, Simon Chriscoli and his son, Luca, spent a day in the beautiful sunshine enjoying bouldering on the quarried sandstone at Brownstones. 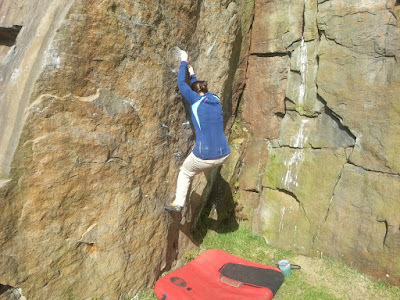 We tackled a few Ash Pit Slab problems first (some a bit worrying due to polished footholds!) before exploring the Top End routes. 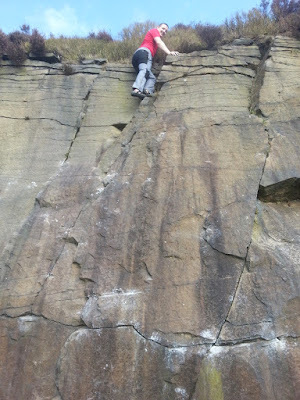 Thanks to Chris for a sage warning about some of the dodgy top-outs - the heather at the top was very useful at times! A brilliant, sheltered location and perfect for a return visit to attempt the rest of the areas we didn't get to. Weather was set fair for the whole of the country except North Wales. Fine drizzle greeted us on the Saturday morning so we decided to change our meets program and make a walk straight from the hotel door to the lake valley regions of Crafnant and Geirionydd. Almost immediately the rain stopped but it was still snowing in the high hills. Crafnant is a beautiful valley and there is a walk by the side of the lake to the monument at the head of the reservoir returning by the road, but our task for today was to take the short cut through ancient forest towards Llyn Geirionydd. At the col the 18 strong team divided - those wanting a quick return to the hotel and those who wanted to venture further. For the larger group of 10 it really became an adventure at this point. 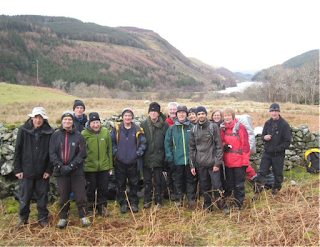 On the map was marked a double backing forestry track to Llyn Geirionydd but after a mile it petered out by a mine. The only solution for further progress was to force a steep downward route through pine forest. 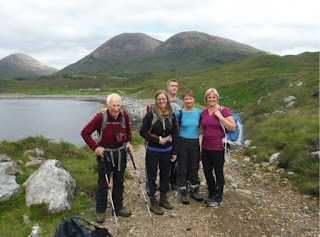 After many obstacles of cliffs and fallen trees it led to the lake in time for a well earned lunch. The return to the hotel was much easier taking a lakeside path. Sunday was forecast to be the better day of the weekend. 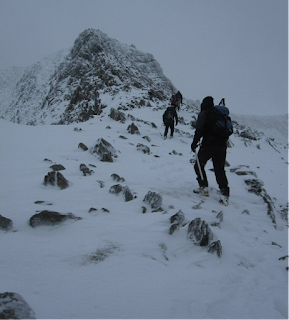 A group of eight decided conditions were acceptable for an ascent of the Y Gribin Ridge to Glyder fach even though it had been snowing in the high mountains for two days. 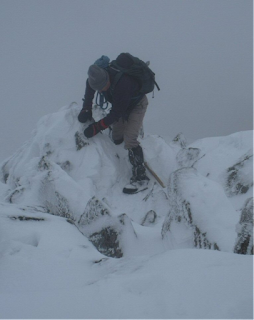 This was an adventure of climbing ice glazed rocks covered in snow. The pictures say it all. Meanwhile another party went to climb Cnicht (the Matterhorn of Wales) but were turned back at the snow line. With all this activity I almost forgot to mention the Annual Dinner. 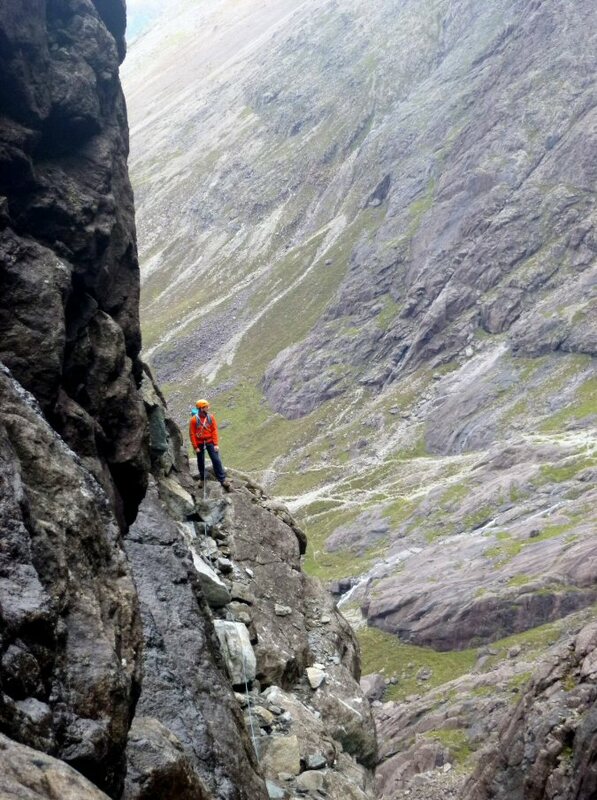 The pre-dinner slide show highlighted the trickier sections of the Isle of Skye Ridge (which the club will be visiting in July) as well as suggesting several bad weather alternatives. The eighteen members present were then treated to a gourmet 3-course meal. During the Annual Dinner, the following Award Presentations were given. Congratulations to all those members. The evening completed with a slide show presented by Dave Archer on climbing Elbrus, the highest mountain in Europe at 5600 metres..
Music entertainment was light as most of our guitar players were absent due to "Mothers' Day Duties. Fifteen members and guests have booked on to the Annual Dinner to date. 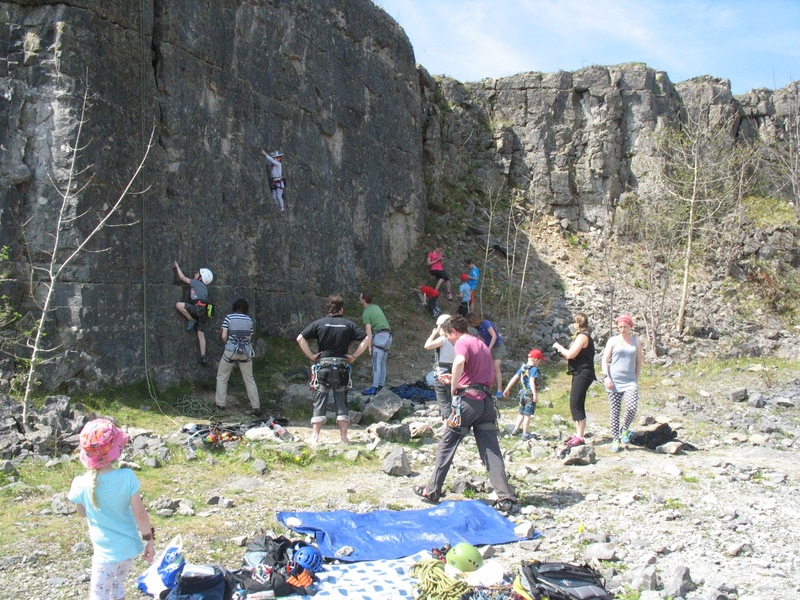 There are four rooms left at the Tyn-y-Coed with the bunk room in addition offering 5 places. Friday evening is meet and social gathering. 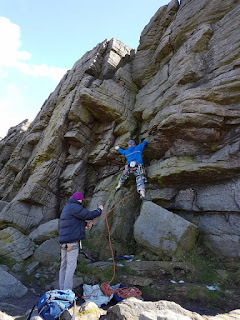 Main Saturday walk: The Gribin Ridge to Glyder Fawr followed by a traverse of the Glyders via the "Castle of the Winds" and the "Cantilever Stone" on Glyder Fach. 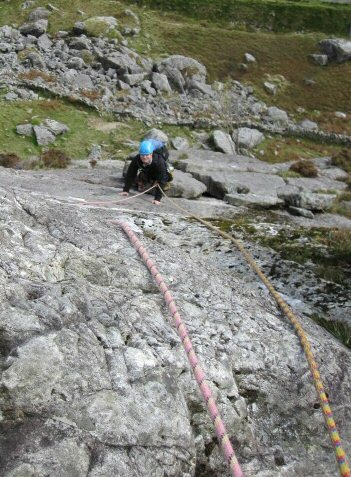 Descent is by scree to the col at Tryfan. 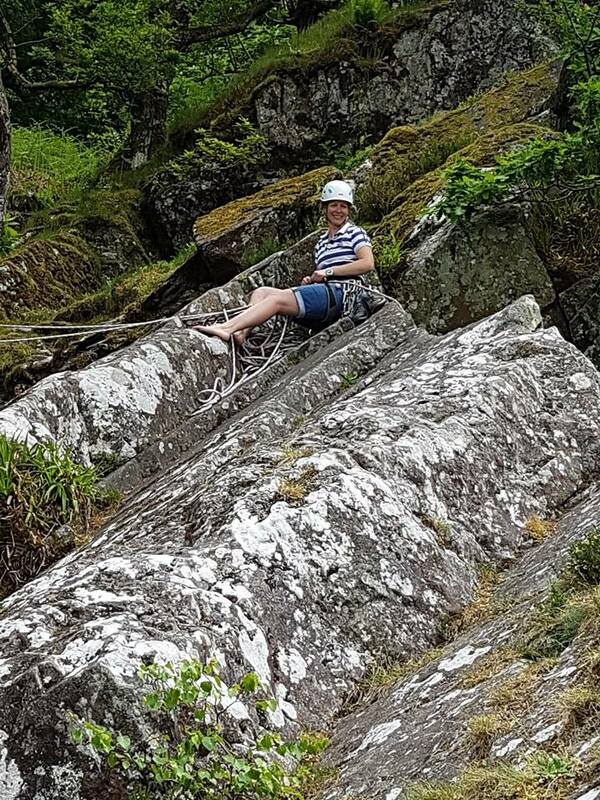 Alternative walk: Follows the Cwm Bychan and Aberglaslyn Pass near Beddgelert. There are many other walks in the region - easy walks in the Betws-y-Coed forestry or harder walks to Llyn Crafnant and Llyn Geirionydd starting north of the hotel. 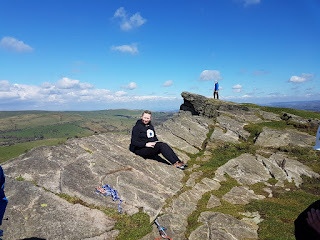 The Dinner on Saturdays night will be preceded by a 30 minute slide show at 6pm given by Dave Archer on climbing Elbrus, the highest mountain in Europe at 5600 ft. There will be an additional presentation of 10 minutes on the Isle of Skye ridges and low level alternatives (note the club visits Isle of Skye July 23rd). Dinner scheduled to start at 7pm. See details and booking form on attachment. 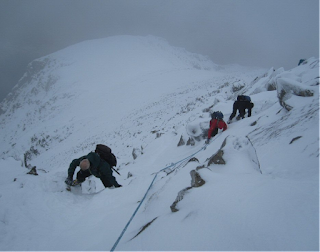 Awards for Mountaineer of the year, Club Member of the year, Chairman's award and Peel of the year will be presented after the dinner. 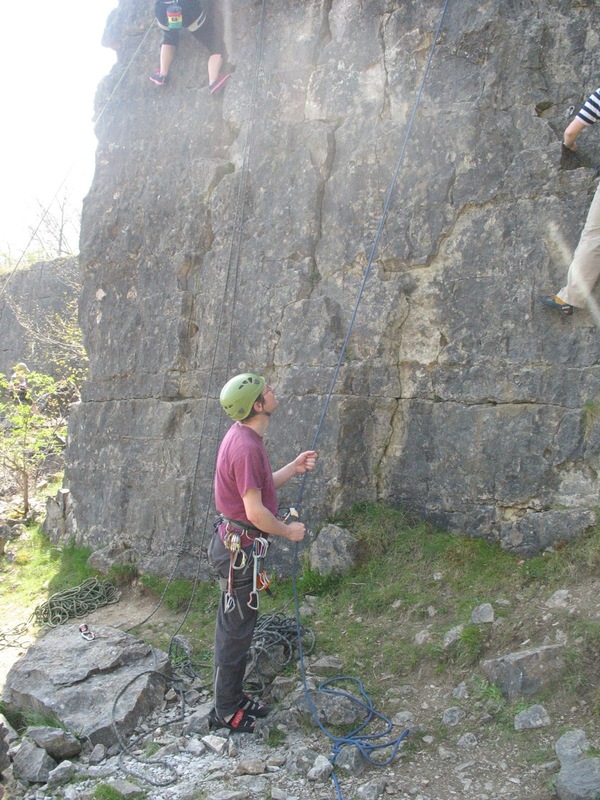 Sunday walk and /or climbing at Tremadoc can be arranged. DON’T FORGET TO RENEW YOUR MEMBERSHIP (£35 for the whole year) BEFORE FEBRUARY 21st. YOUR MEMBERSHIP CARD FOR 2016 WILL BE SENT BY POST ONCE PAYMENT IS RECEIVED. Your BMC membership card will arrive by post late March / early April accompanied by "Summit" magazine. Membership fee for the whole of 2016 is £35. For payment details, please download the Membership form (on the right) or contact st.helensmc@gmail.com requesting information. Don't forget to inform the Treasurer you have paid, as money can appear in our account with no identity. The club will pay £13.25 of your membership fee to the British Mountaineering Council (BMC) the regulatory body of British climbing which gives member benefits of 10% discount in most outdoor retail outlets, discounted climbing courses sponsored by the Sports Council, use of huts throughout Britain and third party liability insurance whilst on the hills. The BMC will send out your membership card in late March. If you are already a member of the BMC or a member of multiple clubs you can claim back the £13.25 by visiting the BMC website. JOINING THE CLUB FOR THE FIRST TIME? 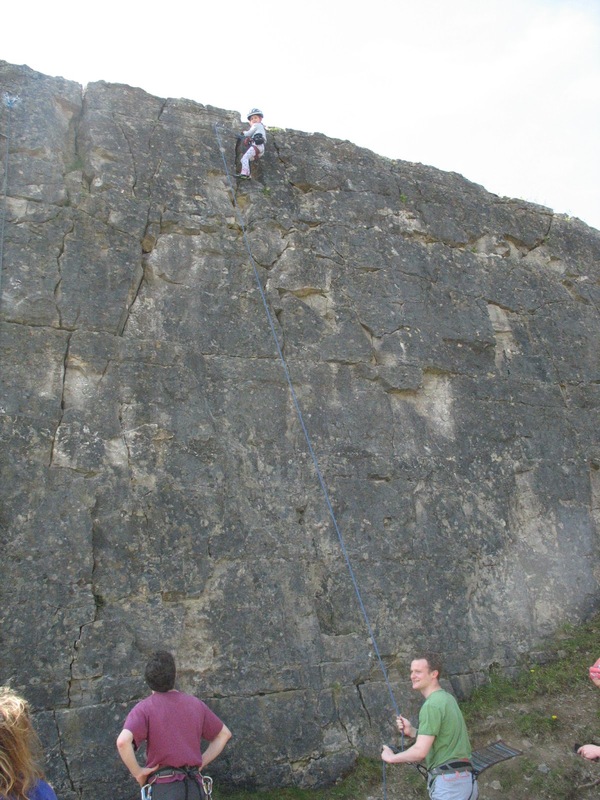 If you want to join the club for the first time you can meet members every Monday evening (excluding Bank Holidays) at the North West Face Climbing Wall, St. Anne’s Church, Winwick Road, Warrington. 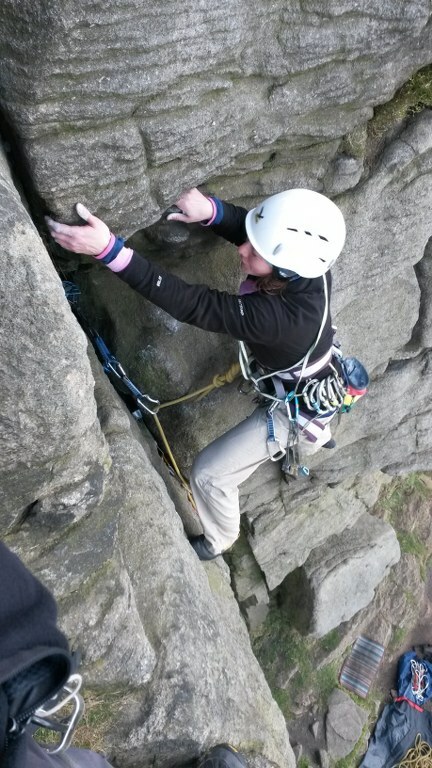 Climbing members usually arrive 7pm. New members are welcome and you will find a group to climb with. (Cost £6.50 members of St. Helens MC, £7.50 non-members). If you are more interested in walking or scrambling, the climbers take a break about 8.30. 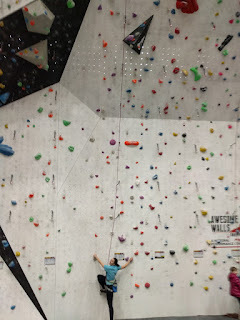 If you tell the desk you are not climbing they will allow you to meet free. New potential members are welcome on any meet. Just book your place with the organiser. WEDNESDAY WALKS (Starting again 10th February). For those lucky enough to be retired or just have a lot of holidays there are the Wednesday walks. 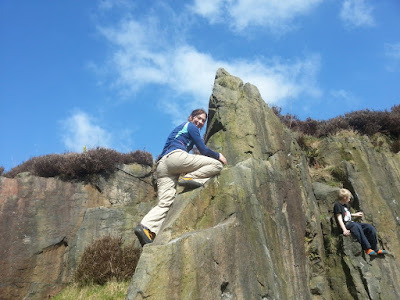 These meet at 10am at a pre-determined walking area never more than 40 miles radius from St. Helens / Warrington. Group size is usually three to six at the moment and there is often a pub lunch. 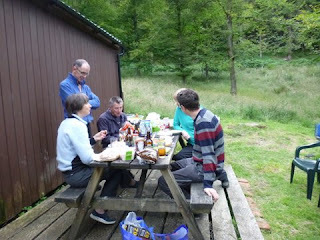 On sunny days in Summer walks may be longer and deeper into the hills with a picnic lunch. 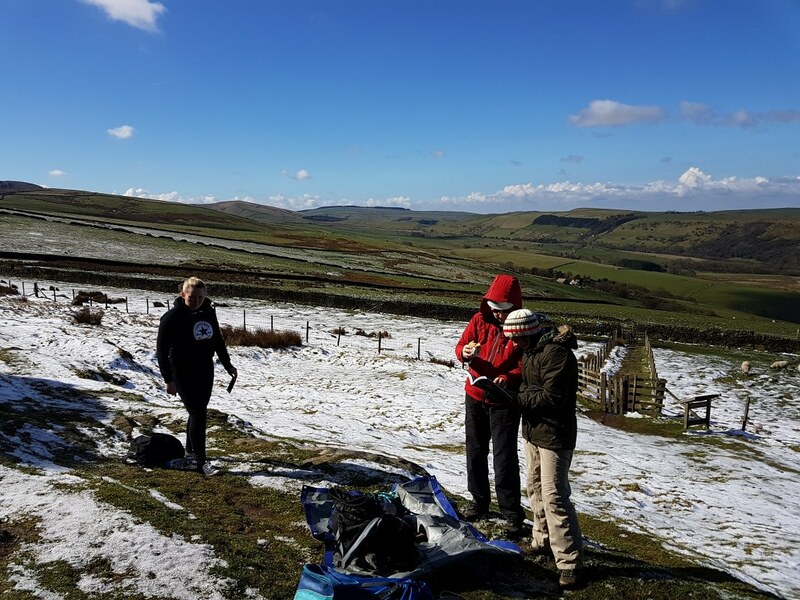 Eight brave souls overcame the one day of winter so-far by heading over the Pennines by Woodhead, as Snake Pass was closed, to savour the delights of Awesome's premiere wall at Sheffield. 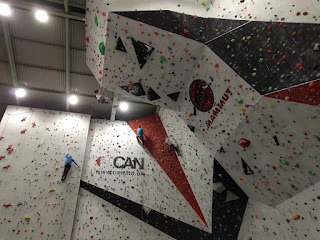 We weren't disappointed the magnificent central overhanging /roof section was an eyeful and even more so for Dave, Andy and Tom and who all gave very impressive efforts on it's 6b+ and 6c+ 'easy!' -routes. As you'd expect plenty on offer at this venue but of note is the feature wall with arm snapping layback crack plus the highly entertaining speed route. We all had a go and the record went to Tom who's 27secs was very impressive and with a few more practise he'll be getting to close to the world record of 10sec ( search on you tube ).